As the branches of a Poinciana tree crowned with bright orange flowers sways gently in the early morning breeze, invariably a few leaves flutter to the ground below causing a slight build up of debris around its roots. This scene is however short lived as a gardener quickly scoops up the leaves and places them in a trash bag. He takes a second glance over his shoulder before moving onto a Palm tree nearby. On any given day, visitors to the Park will see a cadre of the Park's personnel cleaning the grounds, water features and bathroom facilities. They are also willing to give visitors a mini-tour of the gardens while freely giving advice on the care of each plant. Hundreds of persons visit the Park daily. On weekends and especially on public holidays, this amount is significantly increased to thousands. The Park is a choice location for bridal parties interested in taking pictures against the beautiful backdrop of well-manicured lawns resplendent with Bouganvilleas, Ixoras, Lantanas and Roses all year round particularly in the summertime. Visitors may enter though the Park's gates with their various needs but all have very high expectations of the Park's pristine appearance. Lisa Grant, Park Manager said that this high expectation places a tall order on staff to have the facilities in working order and the grounds looking exemplary at all times. 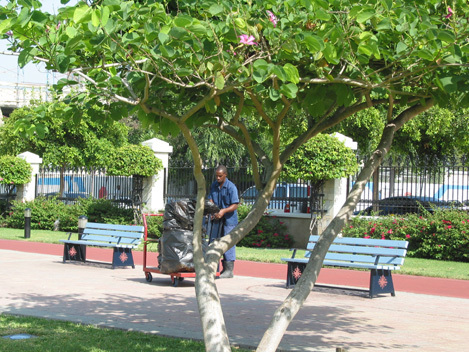 "Our staff here at the Park takes a special interest and pride in ensuring that the Park is always clean and that the gardens are well kept. In fact, they are extremely vigilant and become protective whenever they see a visitor standing on a bench, littering the grounds or doing something that may deface any of the Park's features," noted Miss Grant. The Park currently employs a staff of 28 to carry out daily operations and maintenance activities, which include regular fertilization, spraying, irrigation, mowing, pruning of the general landscape, cleaning of the water features and painting as required. 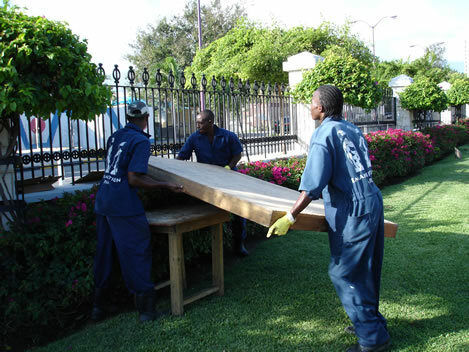 The Chief Park Ranger, Audley Holness, oversees these activities along with his team of four Rangers, who ensure that the Park's gardens and other areas are in excellent condition. Mr. Holness advised that 90 per cent of the Park's maintenance is carried out internally by staff while the other 10 per cent is contracted externally. The Park's opening hours are from 5am to 11pm daily inclusive of public holidays. There are activities that need to be conducted after the Park is closed and so staff members are rotated on a shift system. Radio-controlled security is in place 24/7 and is enhanced by surveillance cameras. Members of the police force from the nearby New Kingston Police Post also patrol the Park on a regular basis. Ground staff and other technical personnel employed by the Park are qualified in their particular field. Several are either graduates of the College of Agriculture, Science and Education (CASE) or the HEART Trust/NTA both highly recommended tertiary institutions. The close attention that is paid to the maintenance and care of Emancipation Park has set it apart from the other parks in the Corporate Area and other parts of the country, ensuring that this venue will be a prime landmark and tourist attraction for many years to come.